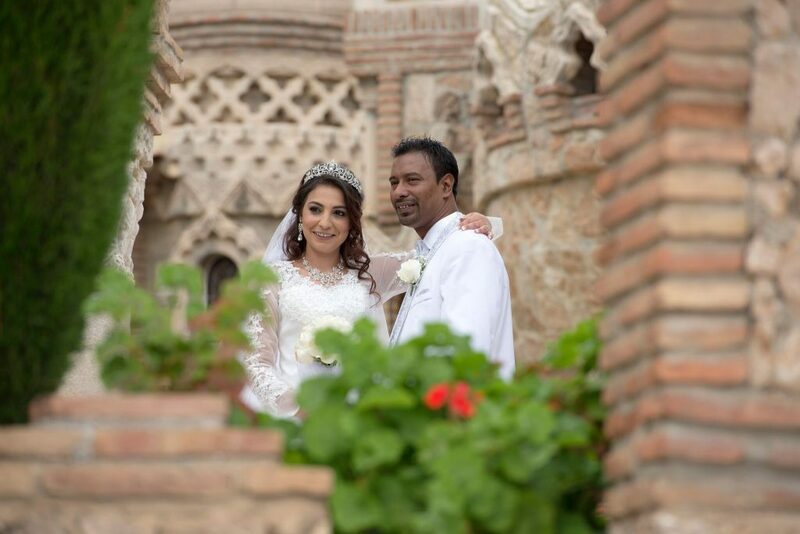 In Part One we met Phil and Justine, a couple who had decided to tie the knot at a luxury wedding villa in Estepona. To find out more about their big day, please read on. On the day of the wedding there wasn’t a cloud in the sky. Justine and her bridal party got ready with the help of hair and make-up artist Liza. What a beautiful bride! Justine really took everyone’s breath away. Photographer Paco was on hand to capture every moment. Time flew by and soon it was time to get this party started. Guests arrived at the front entrance of the property and were served a welcome drink of cerveza or tinto de verano to enjoy on the picturesque front lawn. Once everyone had arrived they were invited into the private gardens at the back of the property to witness the couple’s intimate ceremony conducted by minister Jeff. While the formal photos took place, guests tucked into wildly satisfying canapés such as Marinated Pil Pil on skewers and crunchy Bruschetta topped with Jamón Serrano. Once the couple was ready it was time for the wedding breakfast, which was served next to the pool. Justine wanted the table styling to enhance the villa’s beautiful décor. An abundance of sunflowers were used to create a explosion of colour and set the mood. The floral arrangements were teamed with soft, delicate lace adding a vintage twist. The highlight was the top table of course, dressed with school fête style bunting and boarded by long stemmed sunflower to add the wow factor. The wedding breakfast continued the Spanish theme with a selection of tapas-style starters: Roasted Peppers, Manchego Cheese and Seafood Salad. This was followed by a show stopping live Paella station, much to the delight of the guests. As the sun went down, the Sunshine Weddings team added a romantic glow to the venue by placing oversized candles around the pool – it looked simply magical. Once the speeches had finished it was time to party and DJ Fuller kept the guests happy and on the dance floor all night. Of course, everyone knew it was always going to happen; once one guest decided to dive into the pool, half of the wedding party followed, much to the delight of Justine and Phil. The bridal pair were adamant that they wanted the day to be a celebration. 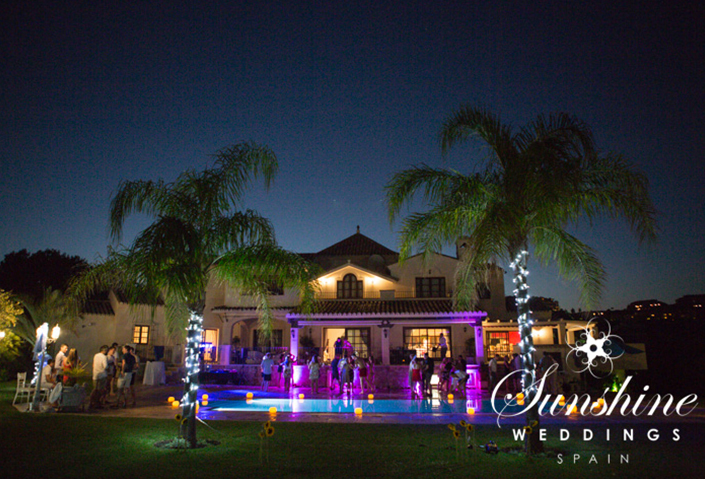 All that mattered was that they were surrounded by friends and family who enjoyed themselves as much as Justine and Phil and the Sunset Weddings Spain team was delighted to be a party of their special day.